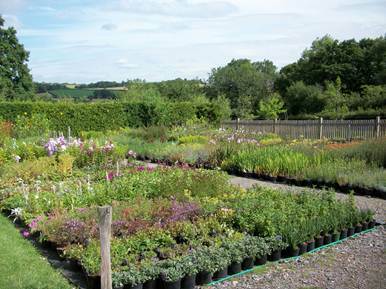 Welcome to Rapkyns Nursery, a cottage garden nursery, set in an idyllic countryside location, specialising in perennials, shrubs, climbers and grasses, all grown ourselves on site. Opening hours Tuesdays, Thursdays and Fridays 10am - 5pm March to October inclusive, other times by appointment. As well as visiting the nursery, you can find us at many events such as local plant fairs, farmers markets and National Garden Scheme open gardens. We are able to take orders for plants to any of these locations for collection or offer mail order between September and April. 'The English Garden' magazine, September 2007, "A Man And His Plants"
"When you love plants, happiness is having the space to grow them and places to sell them. On this basis, Steven Moore has probably reached nirvana." The Daily Telegraph, 4th October 2008, after Sarah Raven visited our nursery in September. "We've rounded up the best nurseries in Britain for year round inspiration. 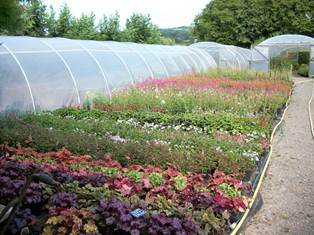 Here Sarah Raven visits Rapkyns in East Sussex for advice on late perennials."